Athens, Greece KARMIC LINK is a project of SYSTEM SHOCKS's Kim Kimbo Gustavsson, NIGHTFALL's Evan Hensley and Sthathis Kassios. 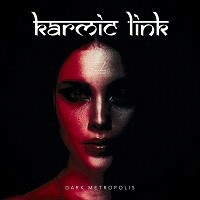 "Dark Metropolis" is their third full length album, the last one been released in 2010. Ranging from industrial, metal, powered by electronics and ambiance and keys, KARMIC LINK is a surprise for me. "Random Phantom" is the first track of the album, sounding like synthpop. The vocals are industrial related, keys and samples are greatly used. The guitars are there too, I cannot say if i like it or not. I'm kinda stuck in between. "Dark Metropolis" reminds me of gothic industrial acts like VNV NATION or WUMPSCUTT. The vocals a more harsh and sharp and the rhythms are cool and catchy. I see FRONT LINE ASSEMBLY of NEPHILIM influence.The guitars are more elaborated while being simplistic, while the drums are synthetic. "The Tone of C" is dance floor ready. I hear a very weird bass part around minute two. The lyrics are very basic, this one is not my best, sorry. "False Spots on the Highway" starts with rhythm guitars and ambiance driven by the keyboards. The vocals are more clean, not saturated. The ambiance is great overall. There are a few variations and choruses.T his is my favorite for now. The way the lyrics are sung (the rhythm) sounded erratic a couple times tho. In "Your Fire will Burn for Centuries," I like the bass sound. Reminds me of plenty of bands i like in the gothic rock scene. This one is KILLING JOKE inspired for sure. "Riama" is an interlude on piano with some strange sounds in the background. "Endless" is maybe the most well balanced song of the album…industrial rock, catchy, and effective. "Lost Magic Alchemy" in the first minute or two it's kinda monotonous and repetitive but right after that some guitar expressions saves the day. "Nostalgia" is a strange and obscure smooth song with cool rhythmic riffing. I can see the horror, the bleakness. Organ can be heard that adds up to the tragedy. The guitars are working altogether to bring some emotion and passion, but for me i had a hard time appreciating it. KARMIC LINK is unusual,disturbing at some times, great but it feels like something's wrong most of the time, and the worst thing about it is i can't put words on why i felt like this. The production is sometimes really not there, while sometimes some instruments needed more love.